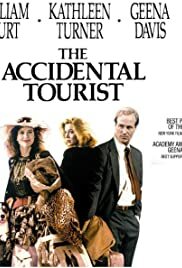 Another bonus material from "The Accidental Tourist" along with Lawrence Kasdan's introduction for the movie. The great thing about this short is seeing Geena Davis, Kathleen Turner and Kasdan interview clips from 1988, promoting the movie. The flip side of this...they reveal too much about the film, so if you're about to watch it, skip the bonus material because it's not a behind the scenes kind of thing, it's just rambling about the story (the short concludes with movie's ending so what in the world were Warner Bros. thinking??? ).